To go with CNY and celebration food, I had made some Chinese gnocchi called Abacus beads 算盤子. 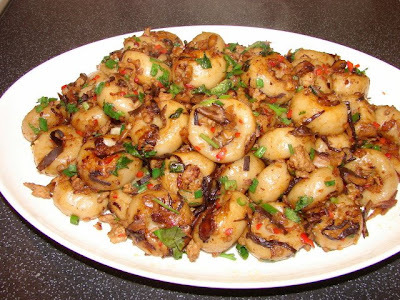 This is typical Hakka cuisine and is eaten at most Hakka celebration meals. It’s a good luck dish because the dumplings are round, smooth, sticky and chewy similar in meaning to Chinese as the sticky rice dumplings as mentioned in the last post. These round dumplings are made to look like the beads on the ancient Chinese calculator the abacus, eating them are considered a blessing for good luck, wealth and fortune and children will be brainy to count and good with maths! Such is Chinese superstition! Very similar to the making of Italian gnocchi, instead of potato we use Chinese yam or taro which looks like this, if you can’t get the fresh one get some frozen like this pack I got from my local Chinese supermarket. For the flour, we use tapioca starch. The dumplings are quite chewy compared to gnocchi. Once boiled the dumplings are stir fried with vegetabls, meat or anything you like. I have also seen the dumplings deep fried rather than boiled, I guessed deep fried could be nice but may be greasy. This recipe is the typical method to stir fry these dumplings. If you use fresh taro, peel and cut into thick slices about 1 – 1.5 cm thick. Cautions: Do wear gloves if you handle fresh taro some people can be allergic to the sap oozing out when you peel the skin. If you use frozen just leave the taro to defrost overnight in the fridge. Then lined a steamer with baking paper and pierce the paper to allow steam to flow through and condensation to flow back into the pan. Place the taro pieces on the paper and steamed till cooked through. Take them out and mash while hot and add in the starch, add oil and enough starch and mix/knead till you get the a smooth and firm enough dough, if too dry add some water, if too wet and sticky add a bit more starch. The amount of starch needed depends on the water content of the taro itself and how much water it has absorbed through steaming. The more starch added the chewier the dumplings. To test if you got the right textur, take a walnut piece of the dough and roll into a ball and gently press in the centre with your thumb to make a deep dimple if it cracks badly then it is too dry, add more water or a bit more oil till you get a soft enough dough. Then divide the dough into 3 – 4 pieces. Then roll each piece into a sausage and cut into equal bite size piece. Roll each piece of dough into a ball and pinch gently in the centre with your thumb and index finger together to make a deep dimple (both sides) like a belly button or a Werther original sweet. See slide show as mentioned above. Boil a large pan of water and boil these dumplings, don’t crowd the pan. Wait till the dumplings float onto the top and boil for another 30 seconds or so before you scoop them out with a slotted spoon. Put the dumpling on a plate. Leave to cool slightly before stir fry. If you want to make in advance can keep in the fridge up to 2 days before stir fry. Before you are ready to stir fry, sprinkle water onto the dumplings pull and to release them if they stuck together. In a wok or large sauté pan, add the cooking oil and heat till hot, add garlic and ginger stir fry for few seconds then add mushrooms, wood ear, preserved radish and dried shrimps, stir fry till fragrant. Add minced pork and fry till browned and mince has separated, add a dash of dark soy. Add in the separated dumplings, stir fry till hot add dash of light soy and oyster sauce to taste and chopped chillies stir for few minutes, add in drizzle of sesame oil and pinch of ground pepper. When ready stir in spring onion and coriander. Suitable for vegetarian: omit pork and dried shrimps, use more of the vegetable or include diced or grated carrots and or fried tofu pieces. Sub oyster sauce with veggie oyster sauce. I was born and brought up in UK and my parents both originate from haka and we've never had this?! Hi hakka ngin, Abacus beads are really 'how sit' (yummy) you should try it. As for CNY, I've just come back from holiday, no plan yet. Maybe I will make beggar chicken and bake some Malaysian kuih muih. What type of pineapple cookies (tarts) are you making? There are 2 types in Malaysia, one using a cookies press with a dent in the centre to fill the pineapple paste and the other Nyonya style i.e. spicy flavoured pineapple paste wrapped in pastry shaped like pineapple, the pastry is snipped with scissors which looks like hedgehog and inserted a clove at the end to look like a stem. Another pineapple cookies recipe is Taiwanese style called 鳳梨酥 (foon li su), oblong shaped pineapple paste filled pastry. I asked my mum whether she'd eaten Abacus Beads before as it's a festival dish and she hadn't. Would explain why I never heard of it? Maybe it's not known in her village? Anyway, CNY is fast approaching - so much I want to do, so little time especially as the cookies I want to make need to be done nearer the time! I've seen the pinapple tarts you mean. Flower looking ones (open) and ones like a sausage roll and the enclosed ones in various shapes. Last year I just used a flower shaped cookie cutter and added a blob of pineapple paste (homemade but microwaved tinned pinapple) to the middle. I made fresh pineapple jam/paste yesterday and it's jam-jarred waiting for the baking to start. Will be making peanut cookies; almond cookies/or peanut puffs (yau gok jiy) and I fancy a go at your Lo Bak Goh (Radish Cake). I plan to put them together with some Lai-See sweets I've bought and some tangerines as gifts for my family and husband's family. I will be very busy! Just need to quit the day job! Hehhehheh! My mum made some salt-baked chicken over christmas and it was delicious! Haven't eaten beggar's chicken before. Is it nice? Hi There,Thanks for sharing your good food blog. Hakka food has been enjoy all over the world. Good food like Lui Char ( Grind tea) also healthy.It is popular in the southern part of west Malaysia & Sarawak too. My Malay & kuai loh friends like it so much. Hakka food is very popular in all over state of Sabah too. Can refer to www.thestar.com.my/kuali section. I use to cook hakka dish too. Anyway good job, keep it up.